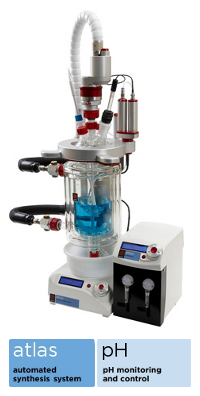 The Atlas pH Monitoring and Control Systems are for chemists who perform pH sensitive reactions. They allow the pH value to be monitored and logged throughout a reaction and the pH value to be controlled using the Atlas Syringe Pump by addition of an acid and/or base. Easy to use: All parts click together without the need for tools - the pH and temperature node clips onto the support rods and is automatically detected by the Atlas Base. Intelligent: pH can be maintained by the addition of an acid and/or base without PC control. Automatic data logging: All data including pH is shown on the base in real time and automatically logged to a .csv file. Powerful: Parameters including temperature, stirrer speed and quantity of acid/base added can be controlled from the Atlas Base. Wide temperature and pH range: pH measurement up to 70°C and pH values 0-14 (note that the rest of the system is suitable for use from -80°C to +200°C). Temperature compensation: When the pH and temperature are monitored together, the pH is automatically temperature compensated. Quick: With an easy to use vessel clamping system and integral oil drain unit, Atlas jacketed vessels can be changed in under a minute. Compact size: Fits conveniently in a regular fume cupboard.